Mercy for Animals recently initiated a #NoAgGag campaign designed to bring attention to the laws proposed in various states that would ban documentation of the routine cruelty at factory farms and slaughterhouses. In Minnesota, an ag-gag bill was proposed in 2011 that would ban photos and videos at livestock facilities. Fortunately, the bill did not move forward. Yet, ag-gag laws have been passed in four other states, and there’s currently one on the verge of being passed in North Carolina, a state with many factory farms. The videos obtained through harrowing undercover investigations make us aware of the horrific conditions on factory farms. Through raising awareness in this way, more people are compelled to consider their food choices and move towards a plant-based diet. The meat industry sees this trend, and their business is hurting. Rather than addressing the animals abuses, they are putting energy into silencing whistleblowers by passing these unconstitutional laws. As part of the MFA campaign, people are sharing photos of themselves with the hashtag #NoAgGag. 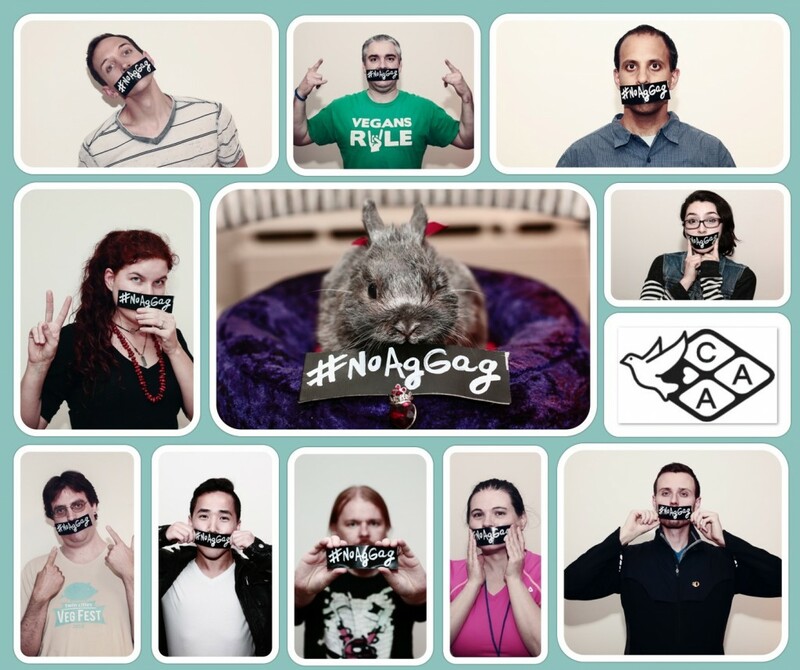 At our most recent Compassionate Action for Animals potluck, a bunch of us decided to participate in the campaign with a NoAgGag photo shoot. You can see a collage of the photos on this page and all of the individual photos on Flickr. Through sharing these images with the hashtag #NoAgGag, we hope to raise awareness for this critical issue, which affects animal welfare, food safety, workers’ rights, and the environment. We believe that it’s our constitutional right to know where our food comes from and that it’s important for consumers to be aware of what life is like for animals on factory farms. Without these videos, the meat industry cannot be held accountable for the abuses they routinely inflict. Take action today! 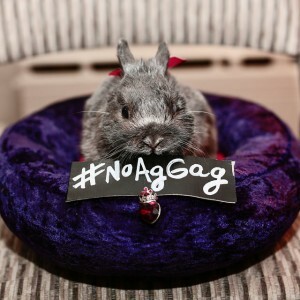 Sign the petition to urge the North Carolina governor to veto this unconstitutional bill and share our #NoAgGag Facebook post.